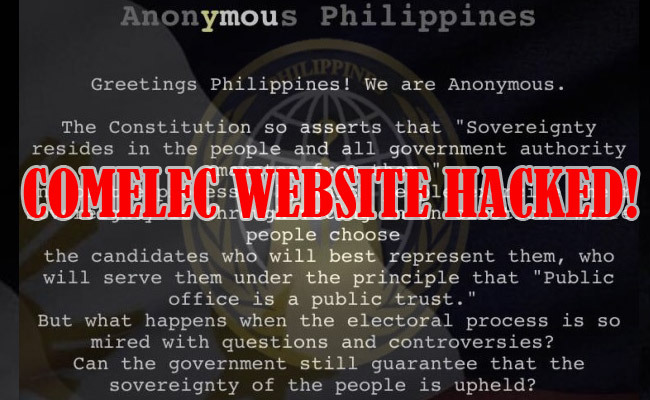 Last Sunday Night, the official website of Comelec (Commission on Elections) was hacked by a group called Anonymous Philippines who were also known for hacking other government websites. The website was still functional until they hack the website from 11:30 pm. They were requesting Comelec to pursue on implementing the security features of Vote Counting Machines (VCM) that was previously called as Precinct Count Optical Scan (PCOS). Anonymous Philippines is warning the government agency for more attacks if they will not activate the voting receipt mechanism this coming May 9 election. They post on the homepage with a statement that people were voting during elections to choose a candidate who can represent and serve them, but what will happen if the elections will be filled with questions and controversies. At the end of their post, they are asking Comelec for the implementation of security features of PCOS Machines and revealed that they are watching their actions. The hacking happened after the critics of Comelec filed a case this week. As of this typing, James Jimenez, a spokesperson for Comelec, revealed that the website of Commission on Elections was now restored early this morning after the cyber attack and they are trying to clean it’s security measures. Another group yesterday also threatened Comelec to leak their databases. A different hacker group “Lulzsec Pilipinas” also revealed through facebook with the same agenda. Days before the hacking incident, the Supreme Court ordered the poll body to have another voting receipts as a security feature for VCM’s. Many critics are saying that Comelec is ignoring the security features since 2010 where it was the first time our country used automated machines. Last March 8, the Supreme Court ordered Comelec to push through the Voter’s Verified Paper Audit Trail (VVPAT) on VCM’s then last March 18 , a 13-0 vote approved a decision that the voters must authenticate their paper audit trail. With the higher court’s decision, Comelec’s preparations will be affected and the elections might move on May 23.